Bravazo – Years from now, racing fans will use Calumet Farm's Bravazo as the answer to a trivia question when they ask, “Who was the only other horse along with Justify to compete in all three legs of the 2018 Triple Crown?” The Awesome Again colt, who finished second in the Preakness Stakes during his Triple Crown run, will look to become more than a trivia question answer Saturday when he makes his 10th start of the year in the Breeders' Cup Dirt Mile. “He's doing well,” Hall of Fame trainer D. Wayne Lukas said. “I think we're in the right spot. When we saw it all shake out at the draw Monday, I thought we're in the right race. The mile distance is good for him. I like the idea of a one-turn mile with a long stretch. I like our Post (eight). I'm looking for a big effort from him. He was in every major dance this year. Maybe he has one coming. Catalina Cruiser – A once-around jog made up the morning work for trainer John Sadler's Dirt Mile prospect, who has been made the morning-line favorite for the race. Regular exercise rider Juan Leyva was up for the undefeated Catalina Cruiser's jog. While the four horses representing Sadler in this year's Breeders' Cup certainly flash a lot of star power, there's a human connection that carries a bit of star quality of his own – exercise rider Leyva, who has a Breeders' Cup victory of his own going back to the 2011 Filly & Mare Sprint with Musical Romance. And where was that? Right at Churchill Downs, which has become one of Leyva's favorite spots to ride. That includes riding Storm in May in the 2007 Kentucky Derby won by Street Sense. Leyva was born in Mexico, but grew up in Riverside in Southern California and began his riding career there. After about five years on the Southern California circuit, he packed his tack and went to South Florida to ride. He finished out a 16-year riding career. City of Light – The millionaire who is one of a short list of horses to beat Accelerate in recent times appears primed once again to be a factor in a race that has a John Sadler-trained horse as the supposed horse to beat. The son of Quality Road will tackle undefeated Catalina Cruiser in Saturday's Dirt Mile with another chance to put a thorn in Sadler's side. City of Light dealt Accelerate his only loss of 2018 with a neck victory over the morning-line choice for Saturday's Classic. City of Light galloped 1 1/4 miles Thursday morning for trainer Mike McCarthy under exercise Nikki Diodoro. Firenze Fire – Mr. Amore Stable's Firenze Fire, who finished 11thof 20 in the Kentucky Derby last May, has returned to Churchill Downs to run in Saturday's Dirt Mile. “I thought he ran good in the Derby. He beat some nice horses. There were a lot better ones behind him,” trainer Jason Servis said. Firenze Fire, who tracked the early pace into the far turn before tiring in the 1 1/4m Derby, would seem better suited to the one-turn mile distance of the Dirt Mile, in which he will face older horses for the first time. Firenze Fire won the 2017 Champagne at Belmont before winning the Jerome at Aqueduct and the Dwyer at Belmont, all conducted at a mile around one turn. In his most recent start, Firenze Fire won the 6f Gallant Bob at Parx to record his fourth graded-stakes win and sixth win from 13 starts. Irad Ortiz Jr. has the return mount. Seeking the Soul – Trainer Dallas Stewart is confident that Charles Fipke's homebred G1 winner Seeking the Soul is going to run his race Saturday in the Breeders' Cup Dirt Mile. Cross-entered in the Classic, the Clark Handicap winner was unable to draw into said first preference and reroutes to the Dirt Mile over the same course and distance of his Ack Ack Stakes win Sept. 29. The bay 5-year-old seems to relish Churchill Downs, boasting a record of 3-1-2 from eight starts, including a maiden victory and the two aforementioned graded stakes. He galloped a mile over the surface on Thursday morning, reported Stewart. Fifth in the Pegasus World Cup this year, he has two wins and two seconds from four tries at a mile and breaks from post six of 10. He partners with Brian Hernandez Jr., with whom he never has failed to hit the board from five runs. 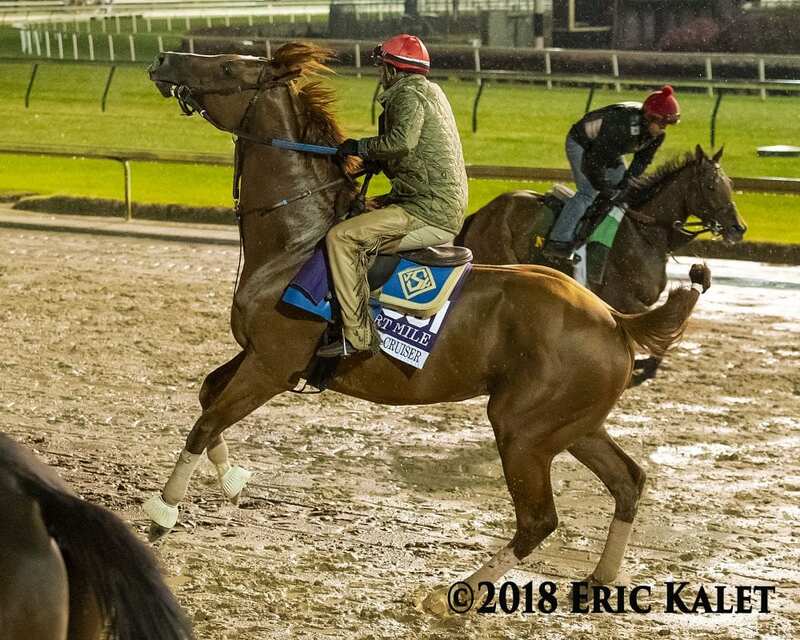 This entry was posted in Breeders' Cup and tagged bravazo, breeders' cup dirt mile, catalina cruiser, churchill, churchill downs, city of light, d. wayne lukas, firenze fire, john sadler, mike mccarthy, seeking the soul by Press Release. Bookmark the permalink.